Our chairman, Mr. Agustí Chalaux, has recently published a new document where he repeats once again, with his well-known provocative style, what he is always telling us: that if today there is material poverty (at a time when there is an actual build-up of material goods thanks to modern technology), we are all to blame, and mainly the governments which are unable to introduce a revolutionary monetary policy. In short, it is a question, of understanding the importance of simple consumers -the people with an altruistic calling and those who cannot or will not get into the productive sphere- as essential market agents, especially in developed societies. Even if Maurice Allais’ hypothesis remains limited to the monetary sphere, his point of view is very attractive to make us understand the economic dynamism represented in a developed society by all the simple consumers (agents of liberal professions, fringe groups, the sick people, the old people, children…) because they help the distribution of the production surpluses through the retail market. 1. Bismarck, Marx and Lasalle. 2. Individuals without a salary. But in a wider sense it defines all the individuals who are not in the productive system, either -as we have just pointed out- because they are forced unemployed looking for a job, or because they have chosen to remain outside the productive system. In this second hypothesis we find a first case, very clear and easily admissible by society: that of altruistic vocations in the service of the community (physicians, teachers, volunteers for the developing countries…). But we must also include here individuals who choose freely to remain outside the production system and who, notwithstanding, have a right to a given subsidy for their sustenance. 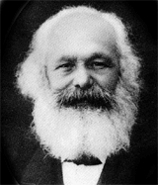 After this analysis, Mr. Allais suggests again -following Marx and Bismarck- the creation of a communal capitalism complementary of private capitalism. The most innovative aspect of his proposal is that of fixing the principles to supply the necessary resources for each of these two capitalisms. Mr. Allais suggests that all those having bank accounts decide on a contractual basis the percentage that they freely leave for the banks to manage following the laws of private capitalism. The remaining bank account balances -always on deposit in the private banks- would be put at the disposal of the National Treasury by computerized means, in order to be used on behalf of simple consumers through a Communal Bank. For these balances the Communal Bank would pay the private banks a high interest which they should transfer to the account owners, which should also bring about a more intelligent notion of the traditional vocation of banks as borrowers from their clients). With these three examples -Bismarck, Marx and Allais- we wish to demonstrate that at present there are alternative solutions for the distribution of the production surpluses by integrating the simple consumers as market agents.